MTFS and Entropy are still pointing lower on this key level. This support level should be fought, but no significant rebound expected before negative entropy is exhausted. There is a support level at 734, but more generally: breaking 740 would be "dangerous". daily: trading range is likely, but support must be confirmed. MTFS and Entropy are again weakening further. We have the final confirmation of the failed recovery pattern mentioned about 2 weeks ago. IT is likely that these [740-750] levels will be be fought, and who knows whether bears or bulls will win. 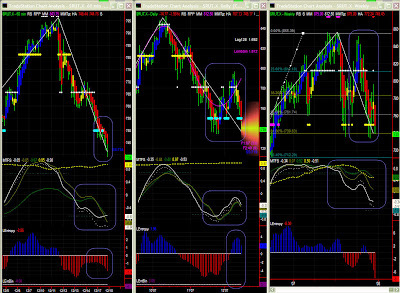 At the moment, only the cycle indicator points up, and we know it is not always a reliable predictor. 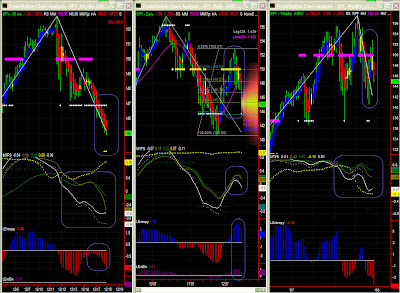 Fairly good quality cycles on daily chart pointup upward in the short to medium term. Like for NDX, the acceleration down came a little bit as a surprise. The lower part of the trading range (147) was broken to reach the next level down. 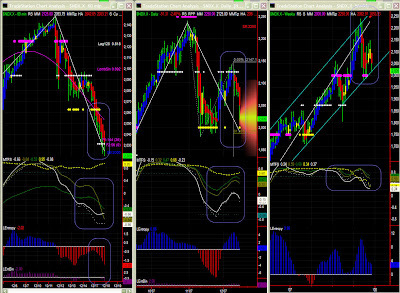 Now, while there could be a pause, SPY seems to point towards 143.75. MTFS and Entropy indeed do not indicate a bottom just yet. Daily: congestion is likely, but wait for support to be confirmed. After 146.8 was broken, SPY surprisingly accelerated to the next support level which is also a stronger Fib level. While a strong rebound looks unlikely, congestion is now quite possible with MTFS lines hovering median territory. MTFS and Entropy gradients indicate some weakness, but no reason to panic just yet. MTFS is unreadable because of the low significance level, hence one should not pay too much attention to the lines down gradients. Note that Swing has turned down again. 60mins: 2000 is now in sight. As I thought, the down move accelerated (cf Entropy) during the course of the day, which is a good sign as it is always best having a support level hit with some energy to generate some reaction. MTFS and Entropy are not indicating a bottom just yet. However, stall level is about here at 2016, and the strong support level at 2000 is in sight now. There seems to be still too much energy to stop the fall on 2016, even if a pause should at least be marked at that level first. I admittedly missed this volatility spike, and thought support levels on the way down would hold at least for a while. It is not uncommon to see MM levels acting as attractors, particularly after a slowdown period. However, MTFS lines while turning down do not indicate a significant move, so a strong support level like 2000 should hold. We shall obviously remain cautious. While significance level is low, this mostly affects MTFS. We can still notice that NDX is touching the lower part of its channel, and the weekly bar is red. Caution should be exercised at these levels.